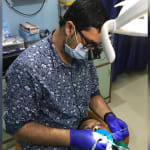 Dr. Sujeet Kumar is a popular Dentist in Hospital Road, Motihari. He has been a successful Dentist for the last 8 years. He has completed PGCE, FAGE, BDS, CERTIFIED ORAL IMPLANTOLOGIST . You can meet Dr. Sujeet Kumar personally at RAMCHANDRA DENTAL CLINIC (Dr.sujeet kuma in Hospital Road, Motihari. Book an appointment online with Dr. Sujeet Kumar on Lybrate.com. Lybrate.com has a nexus of the most experienced Dentists in India. You will find Dentists with more than 38 years of experience on Lybrate.com. You can find Dentists online in Motihari and from across India. View the profile of medical specialists and their reviews from other patients to make an informed decision. highly sensitive tooth is one of the first signs dental caries.sensitivity to cold foods is an indication that tooth is still alive.There is a possibility of saving the tooth with a filling if treated on time.However, this may warrant root canal treatment.